Sri Lankan security forces killed at least 18 Tamil Tiger guerrillas in three separate confrontations in the eastern district of Batticaloa, the Defence Ministry said today. President George W. Bush became the second US President to visit post-war Vietnam today, looking to advance mutual trade and security ties and avoid dwelling on a war that still strains the American psyche 30 years later. The USA and Pakistan have been quietly rebuilding their military-to-military relationship disrupted in 1990 when Washington slapped restrictions on Islamabad for its efforts to develop nuclear weapons, says a congressional report. A US nuclear scientist who toured North Korea this month has said he believes the North has enough fuel for as many as nine nuclear weapons. Milton Friedman, one of the most influential economists of the past century and winner of a 1976 Nobel Prize, died this morning of heart failure at a San Francisco area hospital, a spokeswoman for his family said. He was 94. 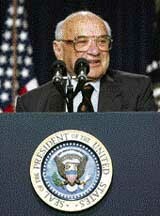 A free-market economist, Friedman preached free enterprise in the face of government regulation and advocated a monetary policy that called for steady growth in money supplies. "Due to the successful retaliation, troops confirmed that 18 Tigers were killed," the ministry statement said. "Troops were also able to recover a stock of arms, ammunition and war-like materials." However, the ministry did not say if troops had suffered any casualties in the clashes. Thousands of Vietnamese, some smiling, some impassive, some astride motorbikes and bicycles, lined the streets of his motorcade route as President Bush arrived in Hanoi to attend the 21-nation Asia Pacific Economic Cooperation summit. He quickly got down to business, discussing Asian security challenges, including North Korea's nuclear programme over lunch with a close ally, Australian Prime Minister John Howard. While in Hanoi President Bush will meet the leaders of the other countries trying to persuade North Korea to forswear nuclear weapons, Russia, China, Japan and South Korea. The report by the Congressional Research Service notes that in June 2004, President Bush designated Pakistan as a major non-Nato ally of the USA. The report says the close US-Pakistan security ties of the cold war era - which came to a near halt after the 1990 aid cut-off - have been in the process of restoration as a result of Pakistan’s role in the US-led anti-terrorism campaign. The Pentagon reported Foreign Military sales agreements with Pakistan worth $ 344 million between 2003 and 2004, growing to $ 492 million in 2005. In June 2006, the Pentagon notified Congress of a possible foreign military sale to Pakistan worth up to $ 5.1 billion. The deal involves up to 36 F-16 combat aircraft, along with related refurbishments, munitions and equipment, and would represent the largest-ever weapons sale to Pakistan. Congressional concerns about the sale and displeasure at the Bush Administration’s apparently improper notification procedures spurred a July 20 hearing of the House International Relations Committee. During that hearing, many members worried that F-16s were better suited to fighting India than to combating terrorists; some warned that US military technology could be passed from Pakistan to China. The USA has undertaken to train and equip new Pakistan Army air assault units that can move quickly to find and target terrorist elements. His ideas played a pivotal role in informing the governing philosophies of world leaders like former British Prime Minister Margaret Thatcher and former US President Ronald Reagan.